Tag line: "Startling new motion picture footage of the elusive creature"
Day two of my five-day exploration of Mill Creek’s Drive-In Movie Classics Collection led me to The Legend of Bigfoot, a peculiar documentary from 1976 in which nature explorer Ivan Marx sets out not only to prove the existence of Bigfoot, but also piece together what it is that makes the big guy tick: his history, migration patterns, food of choice, etc. 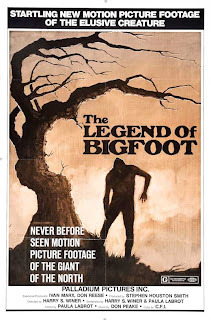 Filled with stock footage of forests and woodland creatures, The Legend of Bigfoot is a laugh-riot, which is unfortunate because I’m pretty sure Mr. Marx was trying to make a serious motion picture. After starting things off with some home movies of he and his wife (taken at a place he refers to as “Bear Ranch”), Marx talks of how he was called to Alaska to investigate the deaths of several cattle. The local authorities believed Kodiak bears were responsible, but he knew better. Sure enough, one rancher approached Marx and said it wasn’t bears killing the animals; it was Bigfoot! The problem is this entire sequence is presented by way of Marx’s narration, coupled with footage clearly lifted from an unrelated nature documentary (why else would there be extensive shots of bears frolicking in a river?). At times, what we’re watching is so off topic that we wonder how Marx is going to work it into his story. This is where the unintentional hilarity comes in. Throughout the movie, Marx tosses out one ridiculous observation after another, all in an effort to make the on-screen images fit his outlandish theories. In one scene, we see Marx doing research on a rocky mountainside, carrying a large stone he claims is a footprint left behind by Bigfoot, cast in molten lava thousands of years ago. How could Bigfoot have survived the volcanic eruptions? Fortunately, he found the answer to this question while watching a couple of squirrels. That’s right: squirrels! I won’t tell you how they helped Marx form his hypothesis, mostly because you wouldn’t believe me if I did! Inspired by The Legend of Boggy Creek, Charles Pierce’s 1972 pseudo-documentary about an alleged creature living in the wilderness of Arkansas, The Legend of Bigfoot never captures that film’s down-home flavor, leaving us with little more than a collection of nature movies, randomly strung together in an attempt to tell an amazing story. Needless to say, the attempt failed.